With the rise of destination adventures and group business travel, traveling in a pack is happening more and more. Trips that once were just limited to closing the big deal now include team offsites, industry conventions across the country, and getting the gang back together in Chicago for a fun weekend. The good news? Staypineapple excels at hosting groups of any kind, from bridal parties to business pals to family reunions. So we want to know why YOU are heading out of town with your group! This April we are hosting a contest for the best group photo. Specifically, a funny or creative photo of the pack that you’ll be traveling with soon. Whoever sends our favorite, will WIN TWO FREE NIGHTS at any Staypineapple hotel! To enter, post an old classic photo or snap a new fun group shot photo with the hashtag “#staypineapplepack”. Even if you don’t win the grand prize, we’ll be giving away Staypineapple SWAG weekly to photos we love, so posting more than one photo enhances your chances of winning something! The contest starts April 1st, so there’s no reason to wait - the more entries you post means more chances to win - so keep it fun and creative! Follow Staypineapple on the channel you post your photo. It’s that easy! So have fun going through your old photos or creating new ones. 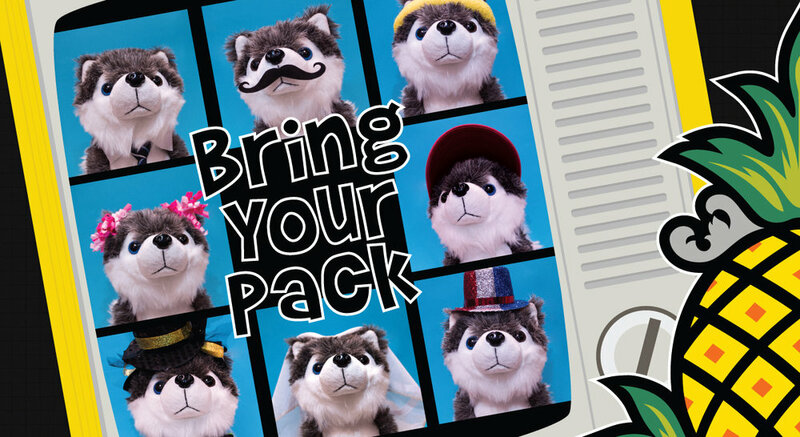 We look forward to seeing what you come up with for you and your pack!